There is a schizophrenic situation in the EU which once created the conditions for more immigration from Africa, but now every EU country wants to stop immigrant inflow, says Pierre Guerlain, a Professor of political science at Paris West University. RT:The issue of illegal immigration has proved highly divisive for the EU, which has been unable to agree a common solution. 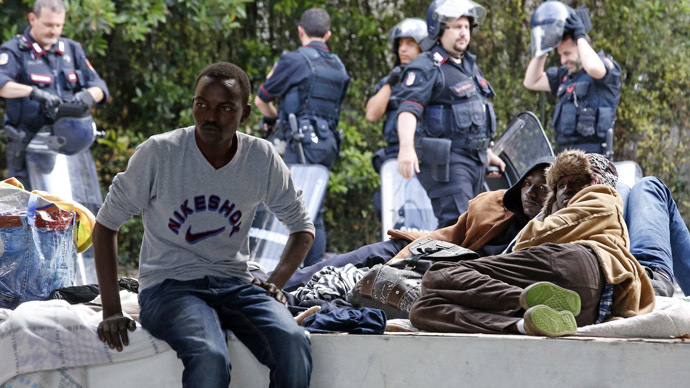 Britain wants more fences; France is tightening its border with Italy. What is this disunity doing to efforts to solve the problem? Pierre Guerlain: I don’t think Europe as a whole is about to solve the problem. You have a context in which you have national selfishness because of the economic crisis. People in so many countries in Europe do not want to have immigrants and therefore people in power do everything they can to keep the immigrants away on one level. Yet at the same time, if you look at the foreign policy of countries like France, it created the desire for a lot of people to move to Europe because the chaos in Libya is in part a result of an international intervention in 2011. So you have a totally schizophrenic situation where on the one hand Europe created the conditions for more immigration from Africa mostly, and now every country wants to stop the immigrants, even the political refugees from coming into their country. It’s a kind of beggar thy neighbor policy. France wants to protect itself from immigrants coming from Italy, British from immigrants coming from France, and so on. RT:Can EU member states agree a common solution? PG: Even in the sort time it’s not very likely that there will be a European solution. Maybe some states – and it’s already the case for Sweden or Germany - are willing to have more refugees, but on the whole I don’t see Europeans agreeing about quotas; as the EU suggested: Each country should have a quota of refugees or immigrants. I don’t think this is going to happen because of all the national oppositions. RT:What does the fact that Europe can’t agree a common solution show here then? PG: It shows that on this front at least the EU is more a wish than a reality. This is also true about economic policy. There is a lot of disunity. Its one more area in which the EU proves to be a failed dream and it will not accept responsibility for what some of its members have caused in the case of immigration. On the one hand you have this “we cannot accept all the poverty of the world,” as the former Prime Minister in France said, but on the other hand this total shucking off people in other countries. Europe as a whole does less for immigrants and refugees than countries like Jordan or Turkey. RT:Will the EU countries have to deal with the problem on their own then? PG: Already in Greece there is a major problem with the immigrants coming from Turkey; a wall was built in Italy trying to deal with the problem. It’s very angry with Europe because Europe is not helping and the Italians are right to be angry because they bear the brunt of this problem which is the legacy of many different issues. Most probably each country would be left to deal with this particular problem on its own.